We welcome you to another year of family fun for all. 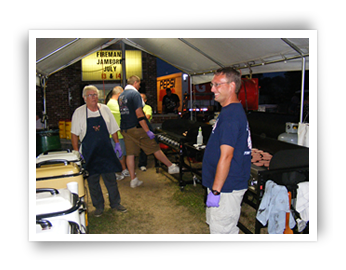 The 55th Annual Firemans Jamboree is July 12th and 13th this year. The Organization thanks you for your continued support and looks forward to seeing you at this years event. We are changing things up a bit. The Car Show normally on Friday evening has been moved to Saturday morning. On Friday night in keeping the event fresh, we've moved our Firemens 5k run/walk to the evening at 6:00 pm. Just two of several changes we've made to try to improve your festival experience. Please come spend the weekend with us and support your local Fire Department. We look forward to seeing you and your family at our piece of "Small Town Hospitality" the only way we know how to do it, Serving others. Checkout our Facebook page for updates and early signups for the 5k as well as the Car Show and Parade. Back by popular demand,, "Family Fun Area" on Eastside of station. Opens at 6:00 pm. Live Entertainment "Family Fun Area" 6:00 pm to 8:00 pm. Classic Car Show: registration Friday night 6-8 in front of station or at 8:00 am Saturday. Judging starts at 9:00 am to 11:30 am. Awards to follow. Enter your car in our Parade afterwards. Uncle Louie's (HA) BBQ Chicken Dinners at Noon. Grand Parade down Main St. at 1:00 pm. Blessing of the Badges (In front of the Firehouse after the Parade) Fire,EMS Law Enforcement and Dispatchers. Grand Prize Drawing at 11:15 p.m. (Front of Station) Plus lots more.